Hallmark didn't ask me personally about my family Christmas traditions but somehow they pegged exactly how I feel about the HO...HO...HO...lidays! For me Christmas is not just a one day celebration but an entire season of festivities, giving, traditions, bonding time, and family centered fun. Building bonds, memories, and anticipation with the children I love truly adds to the joy and sparkle of the season for me. 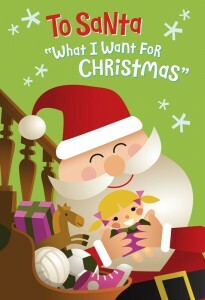 Hallmark's 2012 Christmas line has been designed to better meet the holiday ideals of parents and grandparents. It is a fun way to help build Christmas anticipation for the kiddos you love. My father who is 93 in all of his hard earned wisdom has discovered over his many years that the biggest joys in life are the anticipation of things to come and the memories that we can relive forever. Hallmark has made the anticipation easy, super cute, and really fun this year. The 2012 interactive Christmas greetings are sure to create some special memories too. This greeting would be a really fun one to give. It will be a very special keepsake to your all-grown-up grands one day. This interactive recordable greeting captures the child's wish list in their very own voice! It is then ready to mail off to the North Pole. As a grandma, I wouldn't mind getting one or ten of these in my mailbox too. Anticipation.... How many more days? 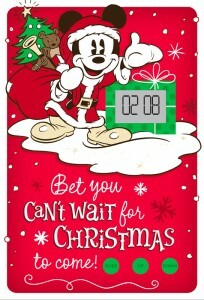 Yep, what kid doesn't like counting down the days until Christmas? We all know how much kids love getting mail. Imagine the smiles upon opening this special little delivery! You can check out these and other Hallmark greetings here. collection of other holiday greetings for review in this post. The Hallmark brand never disappoints! So sorry you missed it. You have a chance to win your very own package from Hallmark too! Your package will be very similar to mine including interactive holiday greetings for the kids and a collection of other Hallmark Holiday Greetings. It is a very nice prize package. that the children in your family anticipate each year or a favorite holiday memory. For me it would be my Grandkid's Christmas Daycamp. A full day of holiday fun for just the kids and Papa and I. The kids and I anticipate it every single year! And the memories created.... priceless. Make sure I have a way to contact you in case you are the lucky winner. This giveaway will end on Sunday December 9th. Eating donuts and drinking hot chocolate while we decorate the tree! Decorating gingerbread cookies to leave for Santa! Oh fun! We have abelskievers (little danish pancake balls) every Christmas morning, a tradition passed on by my husband's family. We also LOVE to take a drive to look at the Christmas lights on people's houses. Thank you for the chance to win these cute items! This year will be my third annual Grandma's Christmas Cookie Baking Party. It's that event that really brings Christmas into my home.